As right said, the path to spirituality is two edged sword. One needs lot of resolve and grace from the master to tread on this path. With the benign grace of perfect master of today’s times, His Holiness Ashutosh Maharaj Ji (founder and head of DJJS), the parched hearts of devotees once again assembled in the monthly spiritual congregation held at Divya Dham Ashram on Feb. 4th, 2018 to soak into the divine nectar of Gurudev. Like every month, the event was celebrated with utmost zeal and devotion. 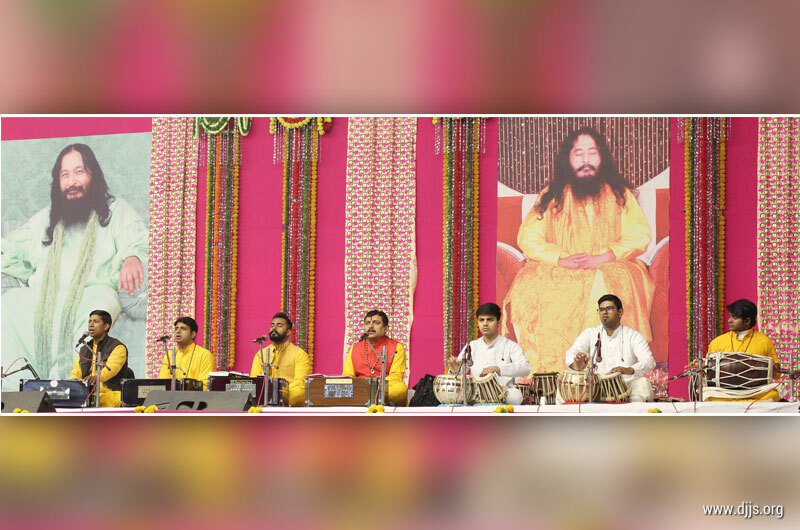 The atmosphere at DDA, in the presence of melodious devotional songs sung by trained musician disciples along with spiritual narratives presented by disciples of Divya Jyoti Jagrati Sansthan (DJJS), became blissful for everyone. Sadhvi Ji, preacher disciple of His Holiness Ashutosh Maharaj Ji elaborated the true meaning of self-awakening. She did so with the help of a devotional narrative. She cited the story of one of the disciples of Shri Chaitanya Mahaprabhu, i.e., Raghu. Raghu was the only son of a rich landlord who had given up everything to become Shri Mahaprabhu’s disciple. However, he still retained a sense of pride on account of being a rich landlord’s son. One day he invited his Guru for dinner in his hut. But Shri Mahaprabhu didn’t appear. Though hurt over his Guru’s non-acceptance of his invitation he began to ponder over the reasons of his Guru’s actions. He came to the conclusion that may be because the food was made out of his father’s money, that’s why his Guru didn’t come for dinner. Next day he went to the nearby village to seek alms. However, while asking for alms he referred to himself as the rich landlord’s son who had left his home to become Shri Mahaprabhu’s disciple. Again, Shri Mahaprabhu didn’t appear for dinner at his hut. Raghu contemplated over his actions, and finally, realized his mistake. On the third day he went to the furthest village and asked for alms without saying a word. This time Shri Guru appeared and ate with him as well as blessed him. Sadhvi Ji explained that that this story of Raghu is a call for all of us to contemplate over our own actions too. We must ask ourselves about the kind of identities we cling to for these very identities are big blocks in the path of spirituality. These identities stop us from seeing ourselves as we truly are, i.e., a part of eternal light. Sadhvi Ji encouraged everyone to pray daily in the feet of Shri Gurudev so that one can remain humble and connected with the supreme. Apart from Gurudev’s command of meditation, Seva and Satsang, Prayer is one such tool which binds the three and help us to leapfrog, not just walk on this path of devotion.